From 1878 to 1887 transport to and from the works was by road. Many goods went by cart, but a large steam traction engine with six trucks was used to bring bricks and other heavy materials up from Burntisland. In 1887 a branch railway line was completed that connected the works to the railway station at Kinghorn, two and a half miles to the east. Works managers sometimes had to deal with complaints from members of the public. In 1880 Robert Kirke complained about pollution in the stream running through his property and the offensive smell from the works. He tried unsuccessfully to halt production at the works, but the company eased the pollution problem by laying a waste pipe from the works to the sea. Accidents occurred from time to time, though probably no more often than was typical for an enterprise of this type. In April and May 1892 there was a major fire in Mine No.1. Mining was suspended, but there is no record of any casualties resulting from the fire. But in the previous year a miner, Hugh Linch, was put on trial charged with culpable homicide. He was accused of failing to attach a wagon correctly so that it ran downhill and crushed Patrick Kelly, who died soon afterwards. In the event Linch was found not guilty. Another incident occurred in Mine No. 2, when two men went to examine a shot that had not gone off. One of the men suffered severe head injuries, and had to be taken to Edinburgh Royal Infirmary by ferry across the Firth of Forth. Production at Binnend had started on a relatively small scale in 1878 under the ownership of the Binnend Oil Company. Ownership changed in 1881, when the Burntisland Oil Company was registered and took over the works. There was major expansion and development, and all went well for the next five or six years. The share price rose from £10 to £23.5s in 1884, and a 20% dividend was paid to shareholders each year until 1886. In 1887, however, oil prices fell sharply at a time when oil production in the United States of America and elsewhere put increasing pressure on the Scottish oil industry. In that year the dividend was 7%, and subsequently no further dividend was paid. In 1892 the directors of the Burntisland Oil company were compelled to put the company into liquidation. An attempt was made to start a new company in 1893, but apart from some production of candles very little work was done. In the following year the mines were closed, and the machinery dismantled and sold. Some years later the land was sold to the Whinnyhall Estate. The census data for 1881 indicate that 36 men were employed at the works in that year. 15 lived in accommodation on the former Binnend farm, while the others travelled to work from elsewhere. 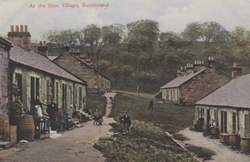 New housing, in two separate areas, was constructed at Binnend after the works were bought by the Burntisland Oil Company. 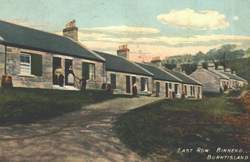 By 1891 there were 95 houses in the High Binn, occupied by 564 people, including 164 workers. 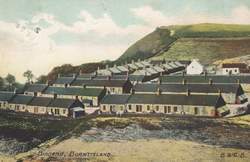 At the Low Binn there were 33 houses, with a population of 192 that included 65 workers. The High Binn was always regarded as having higher status than the Low Binn. It appears this was the result of a larger proportion of people in the Low Binn having Irish origins.They would have been the victims of the negative stereotypes applied to Irish people throughout much of Britain at that time. The houses were built in terraces of single storey dwellings. Each house had just two rooms, with a total floor area of about 405 square feet. The front door opened on to one room, and you would pass through a door to get to the back room. Each room had a fire place and a window. In some houses the space between the ceiling and the roof could be used as a sleeping area, useful for those who had large families or took in lodgers. Dan and Rosetta Connaghan, for example, had five children aged between 1 and 7, and also five lodgers, single men in their twenties.